Here are further exhibitors that fascinated me. This spanish company exhibited some audio servers with original playing/archiving software. Two models are proposed. The Aria Mini is more lifestyle, is an i-Pad dedicated model and costs about € 3.000; istead, the big Aria is a classic tabletop model, costs about € 5.000 and sports better DAC and audio circuit board than the Mini. Both models can stream their content toward other "zones" in your domestic network and can be commanded via an i-Pad. For me, the Mini is much cuter. A long time consulent of Digibit is our engeneer Marco Manunta, but not - as I naively immediately thought - for the "DAC side" of their gear; he is of counsels for their "audio side" and for the software that manages them. 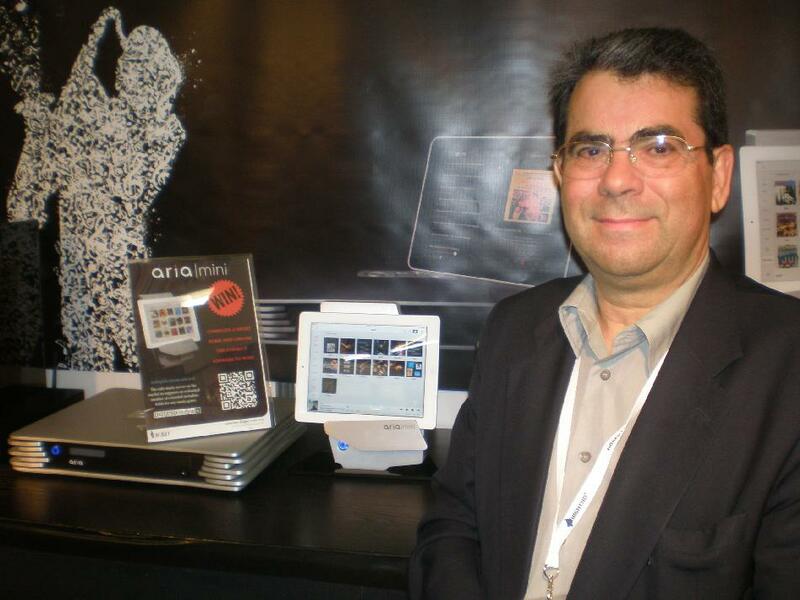 Many of the exhibiting companies are the brainchild of one, sometimes unique, person; for Digibit, it is the nice boss, Samuel Perez, here pictured near his creations (the Mini is the... smaller one). We had lots of pleasant chatter, also in a fluent Italian (good for me... and for you), and he told me that Digibit is offering two more devices, somewhat outsider respect to the pure world of audio-or-bust. The first is the Aria mc, a media center (mc ...) capable of managing files Hi-Res audio PCM (up to 384 kHz / 32 bit) and DSD (up to DSD 256), plus HD video (up to 1080p), that can reside on a NAS, on a PC or on a Smartphone; it works with the vast majority of common communication protocols (Bluetooth, Airplay, DLNA) and it comes in several versions, starting from about € 1.500, and can mount also an internal memory (up to 6TB). Samuel explained to me that they prefer to stop at the mere HD 1080p format because, presently, there are very few 4k files around. Furthermore, they decided not to put a DAC inside their mc because they see it as a device that is going to work always attached to a system - at least an A/V system - so the DAC will be in the receiver (or in the TV). The product is scheduled to hit the shelves for July. Their second strange gear is the Wamp, a device that puts under one roof a receiver of PCM/DSD (also Hi-Res) digital audio data via the usual protocols (Airplay, DLNA...) and remotely manageable by a proprietary software, plus a DAC to convert those data, and a 100 W monophonic (digital...) power amplifier (they can provide also a 50 watter). The cabinet is sturdy and spiked, the idea being it can work also as baseplate for the passive floorstanding loudspeakers that we already own and, once hooked to the Wamp, become functionally identical to those wireless and active loudspeakers that a lot of companies are now producing (basically, putting inside their new loudspeakers what Digibit puts into the Wamp). According to Digibit, it's an elegant and cheap way to follow the two major trends for domestic audio: to update one's system to the modern functions of music streaming and to transform your traditional loudspeakers into wireless ones, thus augmenting in a single shoot freedom of positioning and waf :-) All for the price of about € 3.000: high, but, in my opinion, not exaggerated, if you think how much stuff you bring home, and how much a complete loudspeaker changeover would cost. Moreover, we are not obliged to change those loudspeakers that we like so much (or have grown accustomed to...). Also this year this innovative (former) French start-up, put up a big demonstration of strenght. 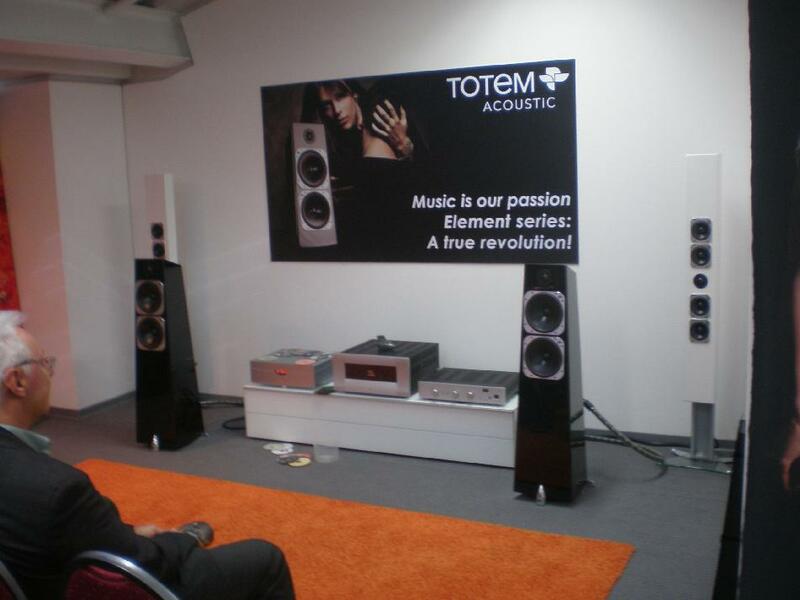 They set up a room dedicated to Phantom, their device that blends the usual - for them - sophisticated electronics for device management and signal amplification, with an innovative fullrange (response specified from 16 to 25.000 Hz) loudspeaker system. All remotely commandable, configurable in how many channels you want, as well as being very powerful, very stylish, etc. Moreover, they set up a more traditional - although this is not the term I'd use to describe this company's products - room where multiple Devialet power amplifiers were geared up to form a system that drove a pair of B&W Nautilus, digitally managing crossover cuts and adaptation to the loudspeaker's electrical characteristics - their S.A.M. system (for which I once again point you to my article on last year's show...). 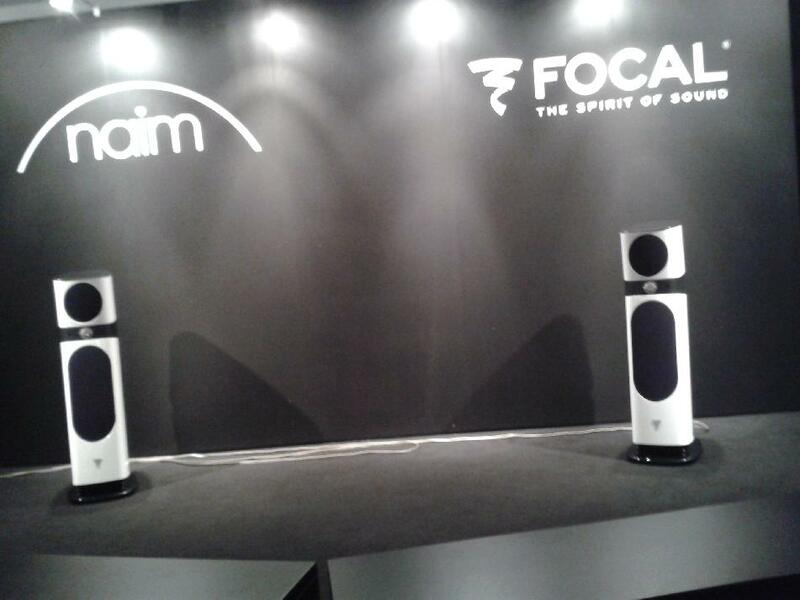 Anyway, this year's news were the introduction of the Sopra loudspeaker line by Focal. 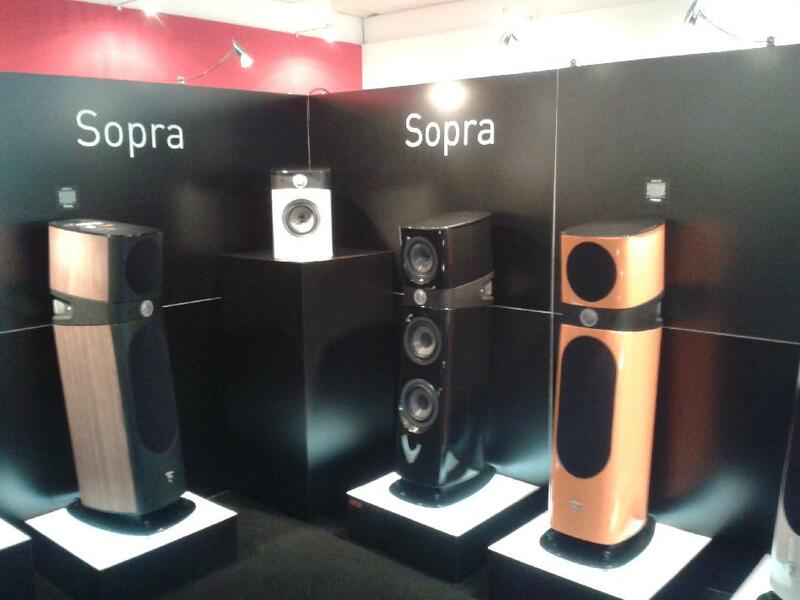 For now, the series comprises a floorstander, the Sopra n.2, at about € 12.000 and a stand-mounted model, the Sopra n.1, for about € 8.000. Both loudspeakers sport an innovative driver building technique (all rigorously made in-house) and have Focal's usual distinctive aesthetic appearance, refreshed while respecting this firm's traditional schemes. The exhibited veneers were really well finished and, yes, here I could effectively perceive that sensation of quality and luxury that last year was magistrally evoked by Sonus Faber's exhibition. Playing in their listening room were two white n.2s that were very evident due to the dark room and the deep black background. Listening in that environment was not meaningful, but, for what it may be worth, I found them more pleasant and correct when I was sitting in the rear rows, far from the direct radiation of the speakers. Moreover, there was also a silent pair of n.1s, that I shot in close-up, trying to pay justice to the care in their construction, and their aesthetics. I want to pay the due respect to this company, proudly British and maker of loudspeakers, and IMHO very well sounding and, looking at their general competitors, also very affordable. 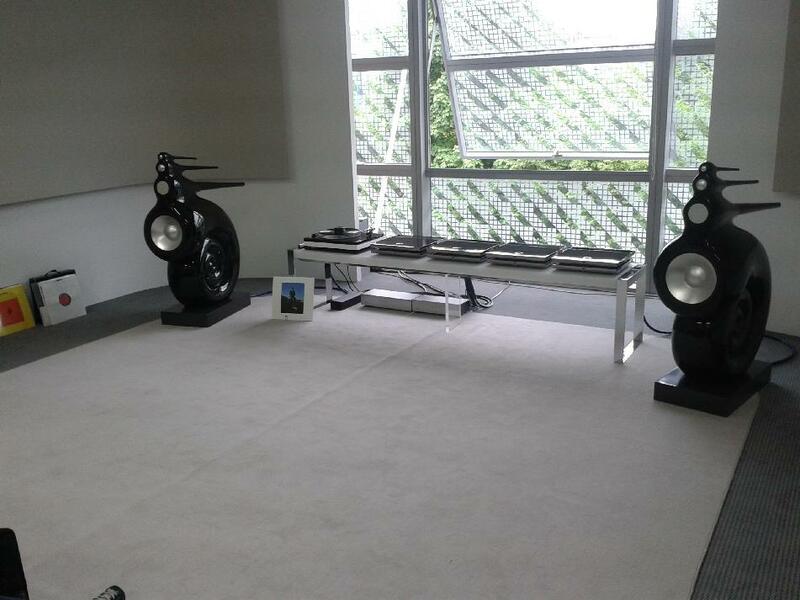 In a big room they exhibited their models, and a completely "normal" system to which they hooked up - alternatively - the 3050 floorstanders (for a price varying from € 758 to € 998 per pair, depending on the veneers), and the 3020 bookshelf (for a price varying from € 318 to € 398 per pair, depending on the veneers). I thought they looked nice, well crafted and neutral in respect to the common domestic room in which they will likely be placed. My listening was always very pleasant, surely amazing for the price; probably a good contribution was also provided by the energy with which the demo was performed by the company's people. Here a system was playing made up with devices completely new to me. CAD makes a two-device source. One is the CAT, both a transport able to rip discs in its internal memory and a network player/streamer, naturally remote commandable by a smart device, even a smart TV. The other is the 1543 DAC, a converter that, intuitively, is based upon a Philips TDA 1543 chip, one of the last few chips that sports the so-called "resistor ladder" (i.e. performs a multibit converson) and that doesn't apply any oversampling (belonging to the NOS/ZOS school). A fact that, for some, leads to the best digital listening experience possible. Moreover, CAD worked on the USB interface, galvanically insulated and with a circuit board specifically designed and developed ad hoc. They are devices produced in little bunches and for very specific tastes; consequently they are not sold at a "popular" price: GBP 5.300 for the transport and GBP 7.250 for the DAC (20% VAT included). For about € 18.000 you bring home a digital source open to the new solutions (streaming, home network) and, at the same time, stuck on a very traditionalist vision of domestic digital audio. Isabel told me they are looking for distributors, also for Italy (as a good Brit, she hoped for someone based in beautiful Tuscany or in the southern seas...): they'll update their website with every related news. 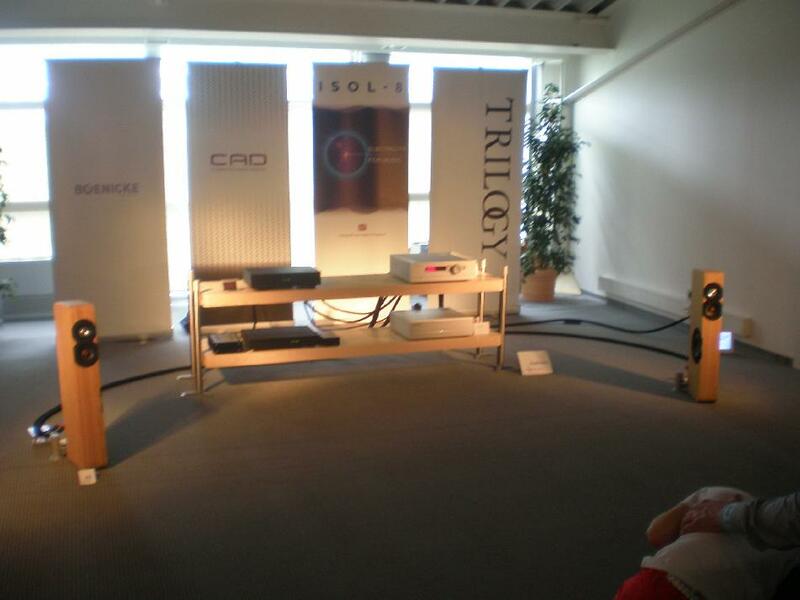 Although the room was big, the sound coming from this system - completed by amplification by Trilogy - managed to completely fill it, leaving the listeners more than surprised. 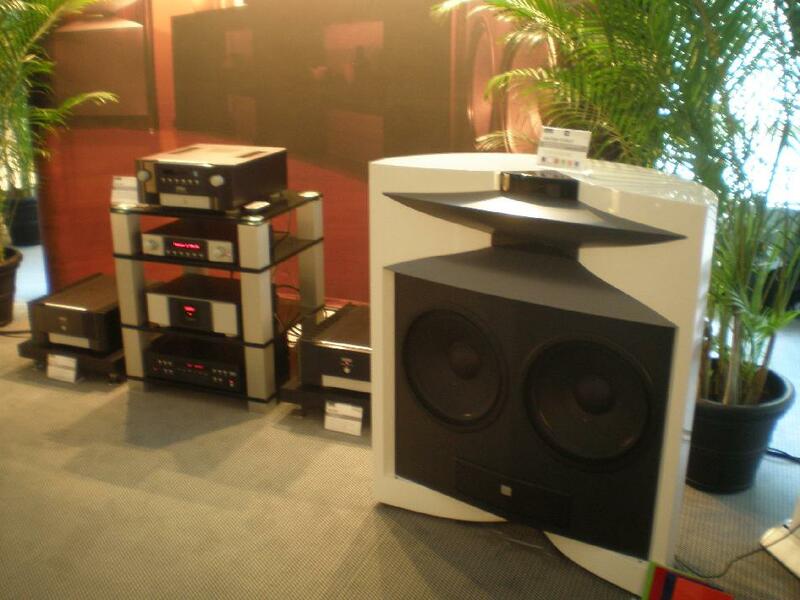 Here, in the same space, two systems were assembled, both with Mark Levinson electronics. The big one sported amplification via a preamplifier + two mono power amplifiers and drove a couple of wonderful JBL Everest 6700, with the usual powerful and authoritative sound usual for this combo. This Canadian company's room was essenntially identical to last year's, and it gave me a conforting sign of continuity and helped very much to fix the memories in the mind, something always difficult in such a huge show. The landlord was again the affable Vince Bruzzese, and his demo kept the kind and effective style I described in last year's article. This year I listened to the demo of their Tribe V model, that was exhibited as a floorstander, but that is conceived, as far as I understood, to be mounted in-wall, and it is made also in a version that allows such an "architectonic" installation. In my picture they are the white and sleek loudspeakers intentionally placed very close to the rear wall, for a very effective demonstration of their emission characteristics, that doesn't need "air" around unlike almost all the others. effectively exhibiting a little system very unfussy to place in the room and easy to match with different domestic environments. Please, forgive me if I once again point you to what I wrote last year, but I think we owe it to honour this company. The Kin Mini satellites (that work very well even as a standalone bookshelf monitor) sport a price of € 680/pair and the system completed with the Kin Sub bears a price tag of € 1.580, so substantially respecting last year's projections of a combination that should be commercialized about the end of the year for less than Euro 1.500". I think that it is also by these things that you can tell a serious company. As I already wrote, at this huge show you can also see that often behind these brands you actually find not only big companies, but also, more often than not, single enthusiasts that take care of their entire business. It's the case, also, of LAB 12, that produces tube amplifications whose look is well finished and utilitarian and, so they say, sporting uncommon circuit ideas. Among their products there is also a power conditioner/distributor, aptly named "Gordian", and a NOS DAC built with a parallel of eight Philips TDA 1543 chips. Their products bear a real-world (well... our insane world) price tag showing clearly their effort to sell affordable things. 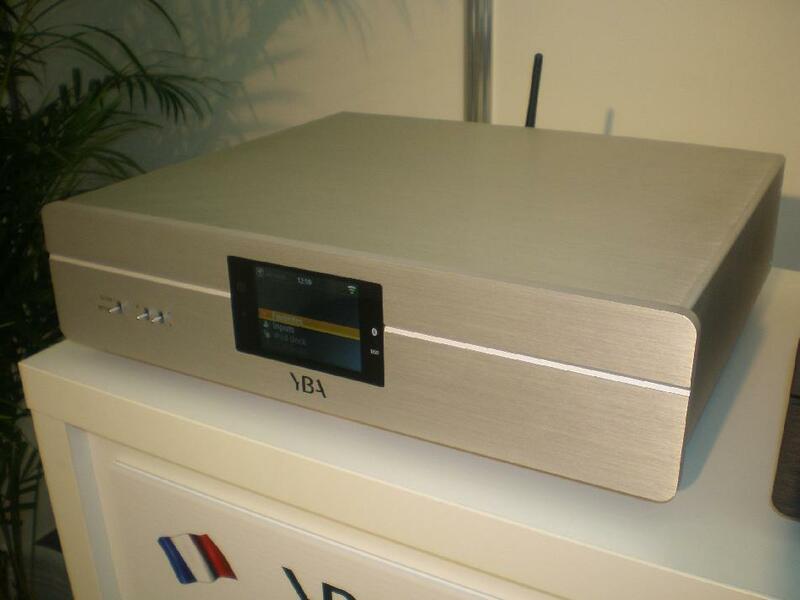 Their most expensive device is the € 3.284 "integre4" integrated amplifier, and their cheapest one is the € 1.168 above mentioned Gordian (all prices VAT included...). I hope that my picture can show the fundamental point: they are regular guys, like you and me. They could easily be two of our friends with whom whe share our passion. Moreover, in my opinion, they deserve further encouragement: they are young and they happen to work in Greece, in the worst moment of a country whose economic conditions are already very bad. We wish them every luck. Hanging around one of the big Hall at ground floor, I met this USA brand, a very technological company, that produces DACs, also portable ones, and dedicated to headphone amplification, very well reviewed. But I was attracted by their system (that reminds me a little of the Digibit Wamp described above, but with a different technology) made of the circa € 1.000 T2, a digital signal wireless transmitter/processor and two € 1.000 each R200s, 200W digital (ICEPower) monophonic amplfiers sporting a wireless receiver/DAC module; it's also available in a version sporting a 50W/ch stereo amplifier, again with an ICEPower module. This system permits you to wirelessly (5 GHz) transmit an uncompressed digital signal up to 22 MHz / 24 bit. It all comes in a travel package. This German company - that owes its name to it being based in Konstanz... - shows a packed series of DAC, preamplifiers and headphone amplifiers, all under the Violectric brand. Among the really numerous exposed models, the company's personnel pointed me to two new ones. The first is their new amplifier for 2 headphones / line preamplifier, with inputs and outputs also in balanced mode, which is proposed in two versions: the HPA V220 model (at € 1.900, 19% german VAT included), that drives the cans in traditional unbalanced mode with two stereo big jack plugs, and the HPA V281 model (€ 1.400, VAT incl. ), that drives the cans in balanced mode, with a balanced plug and two mono big jack plugs, one for left channel and the other one for the right channel. Both models can mount a DAC module (for € 200 more) and their volume control can be also made with a remote controlled motorized potentiometer (for € 250 more) or with a remote controlled attenuator made with relay-switched combined resistors (for € 500). 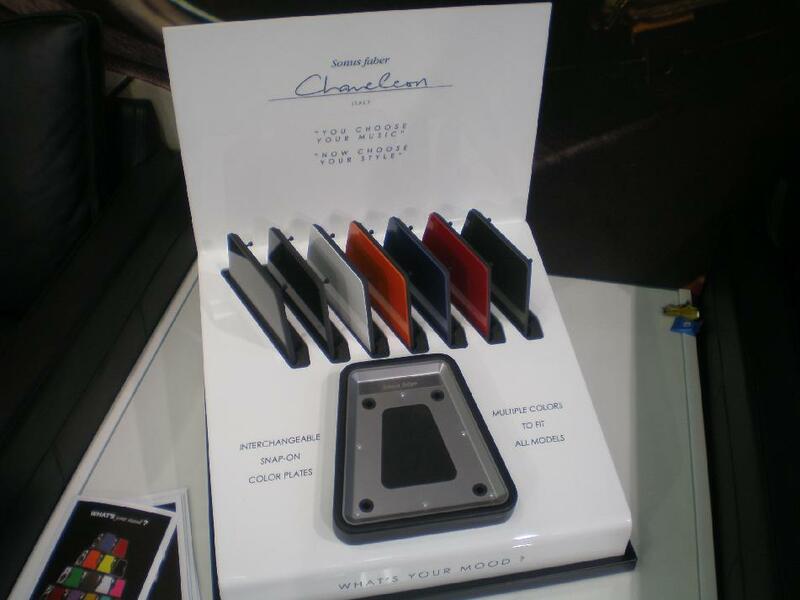 Further new products were their new DACs. 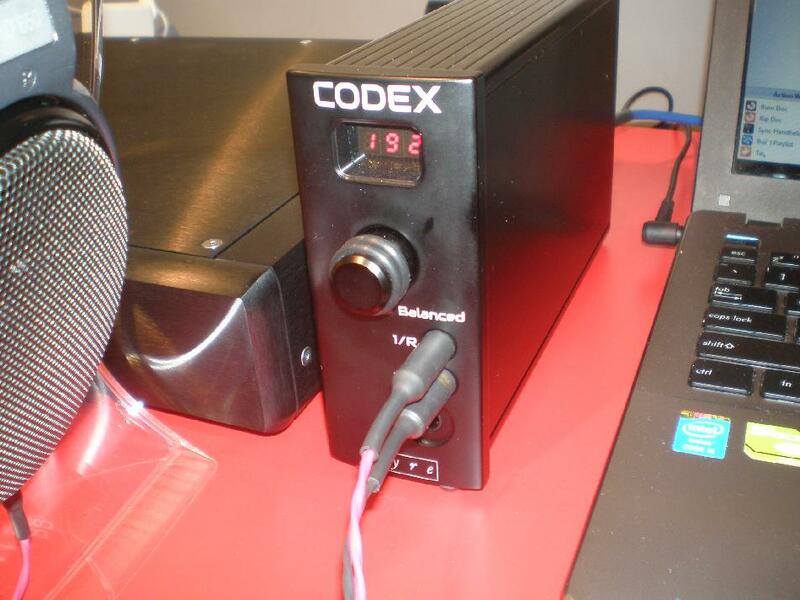 The first is the DAC V850 model (€ 1.400, 19% VAT incl. ), sporting also balanced outputs and digital inputs, even USB, capable of handling high resolution signals (up to PCM 192 kHz / 24 bit). Ihe input digital signal, no matter what its frequency is, first is oversampled at 32 bits and then can be upsampled at 96 kHz (or according to different factors, user selectable); then it is sent to the chip (this time, two PCM 1795, they, too, working at 32 bits). The DAC has also a volume control, solely performed in the digital domain. The company says that, since the signal is always oversampled at 32 bits, this somehow compensates for the unavoidable resolution loss at high attenuation (necessary for a low playback level). Finally, it can optionally mount a board to remotely command the volume control and the input switch, for further € 250. 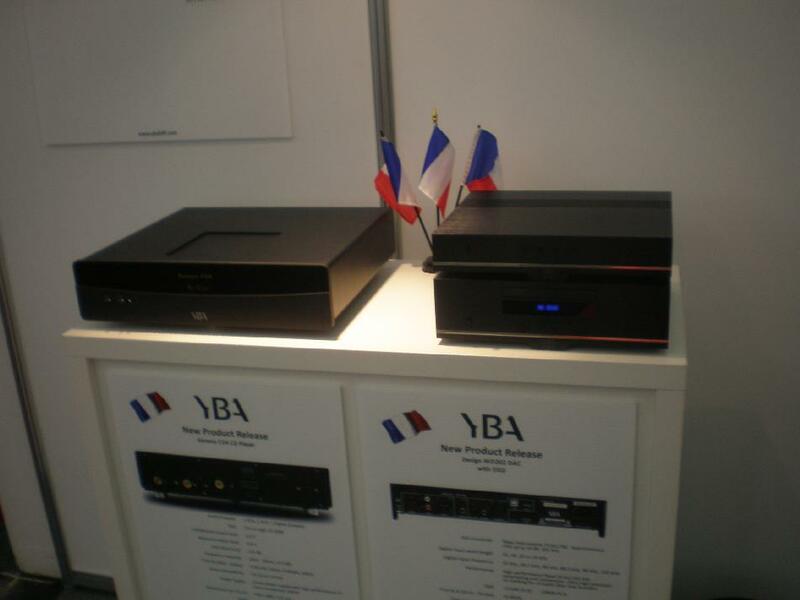 The second DAC is a reduced version of the first one; its' the DAC V820 (€ 750, 19% VAT incl. ), that sports similar features, but the USB input is optional, the oversampling is always at 32 bits, but the upsampling can be set only at 96 kHz, the output volume is fixed, but the gain can be set on four different levels. 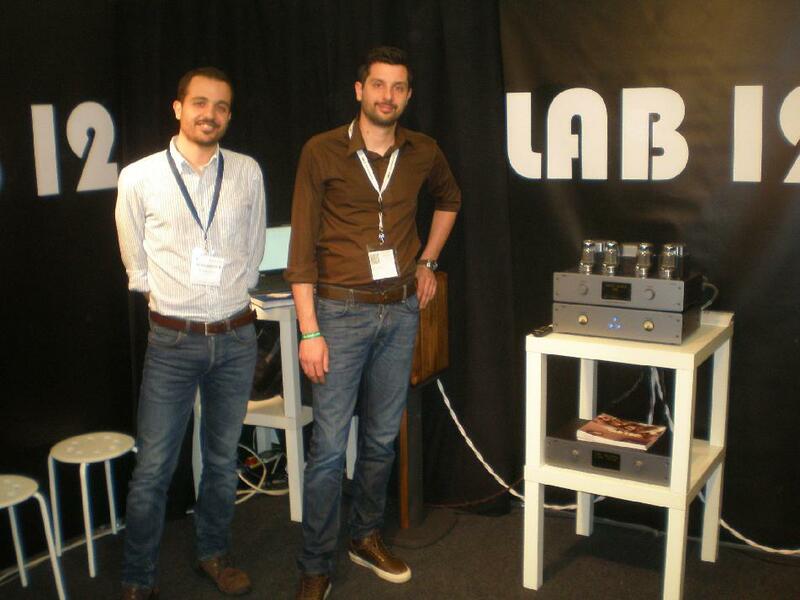 The Bulgarian Thrax set up a big room where they showed a system entirely made of their own gear (sources excluded): Orpheus pre phono (€ 16.200), Dionysos preamplifier (€ 16.200), Heros 100 W monoblocks (€ 25.200 the pair) and Lyra standmounting loudspeakers (€ 16.200 the pair - stands € 1.800 the pair). The electronic gear is presented as designs with original solutions, using either vacuum tubes (mainly direct heating triodes), either transistors (MOSFet e JFet), with tricks to reduce the risk of picked up noise (input transformers, disconnection of the ground of the unselected inputs, etc.) and for an effective coupling with the load. They are unquestionably very expensive devices, and I personally think I could never be able to afford them. 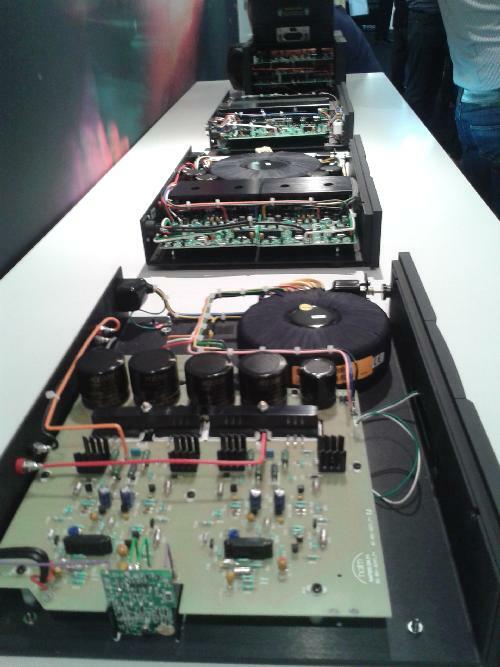 Yet, among the many crazy things seen at the show - that, after all, is literally entitled to High End... - they, at least, recreated a very pleasant and really involving sound. In other words, one of those cases in which you just want to stay and listen, not worrying about the surrounding problems. Isn't this one of the main benefits of attending such a show? To be exposed to devices normally out of our range and, in this case also out of our possibilities, since the building of their international distribution net is (still?) in progress. This year Yves-Bernard André set up his space in one of the big Halls at ground level like a French Island where its landlord greeted his selected guests with plenty of tricoloured flags, champagne, etc. But, with its distinctive original touch, YBA exchanged the Gallic grandeur with a British understatement. All the models were in silent exhibition, accompanied by their written description, and it was up to the visitor to show his interest in something and, eventually, ask for some information that were then promptly provided. The very cordial brand representative pointed me to two major new devices. that, unlike many similar devices,sports also an internal DAC (in this new series, built around an Asahi-Kasei chip, instead of the former Wolfson chip), aiming to become the real center around which to build an entire system, since it can receive, decode and play practically every digital stream that arrives to its digital inputs. Of course, it sports also the traditional (for a streamer) digital outputs, to connect to a better DAC, even chosen among this same brand's models. a DAC sporting the usual digital inputs (USB, S/PDIF coaxial, optical and AES/EBU), balanced and unbalanced outputs, headphone output and capable, in this new version, also of DSD decoding. Again in a Hall on the ground floor, I met Blue Aura, a proudly British company (in the press folder there were also a little Union Jack...). Also in this case it's a company driven by a real person, Mr. Nick Holland. It produces mainly loudspeakers, set and ready to wirelessly play digital files that can be sent to them either via Bluetooth/NFC, or via a proprietary 2.4 GHz WiFi protocol. 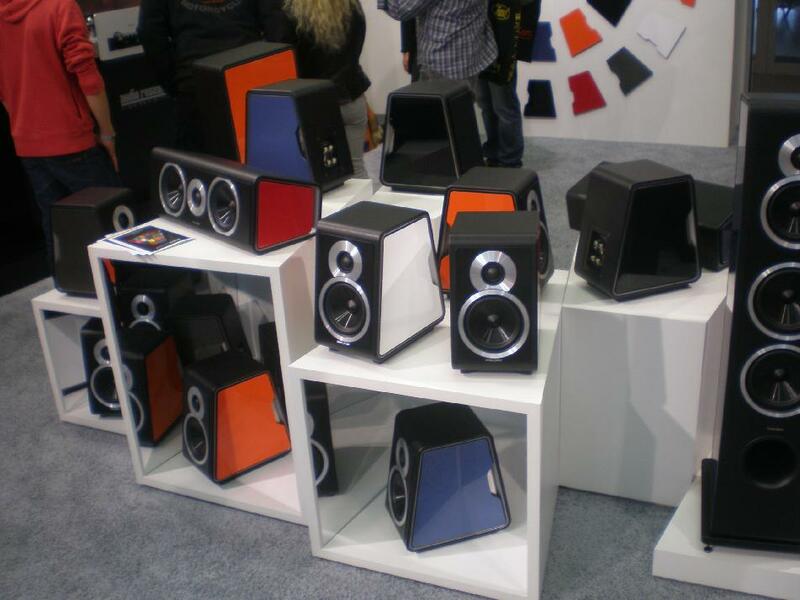 All those loudspeakers are active models and use a DSP. They have minimalistic aesthetics, with an evident effort to avoid useless embellishments that only push up the price, which indeed here is limited. Nothwithstanding this fact, all models are well finished, apt to neutrally match the domestic environment, due to their reduced dimensions and the (eco)leather finishing. I was interested in this brand because I felt that behind the commercial proposal was a thinking mind, always focused on the needs of a normal user of music that wants to easily put sound in his domestic environment. Actually, its solutions belong much to the plug-and-play logic. 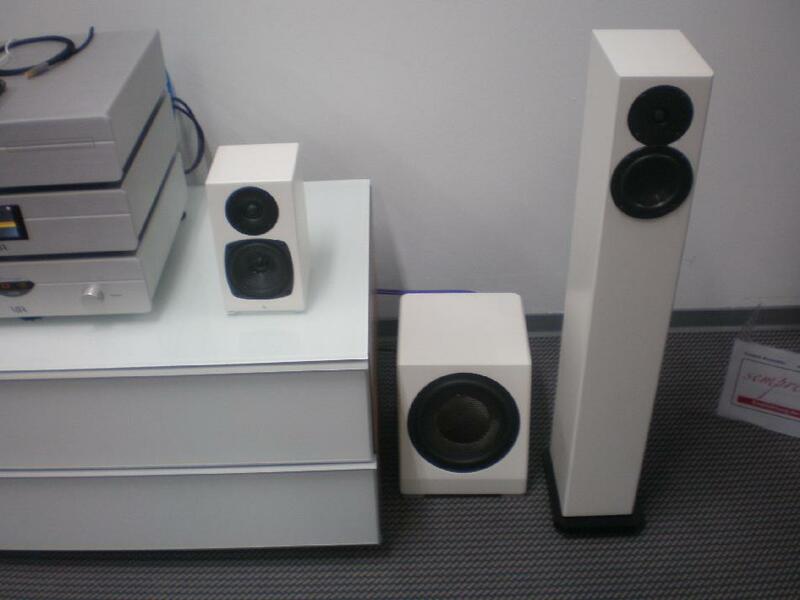 For instance, there is the WS80i system: for GBP 450 it comes with a pair of active (D-Class TI amplification module) bookshelf loudspeakers, a WiFi transmitter (to plug into an existing source or to a PC via its USB port) serving a distance up to 30 meters, and a remote control. 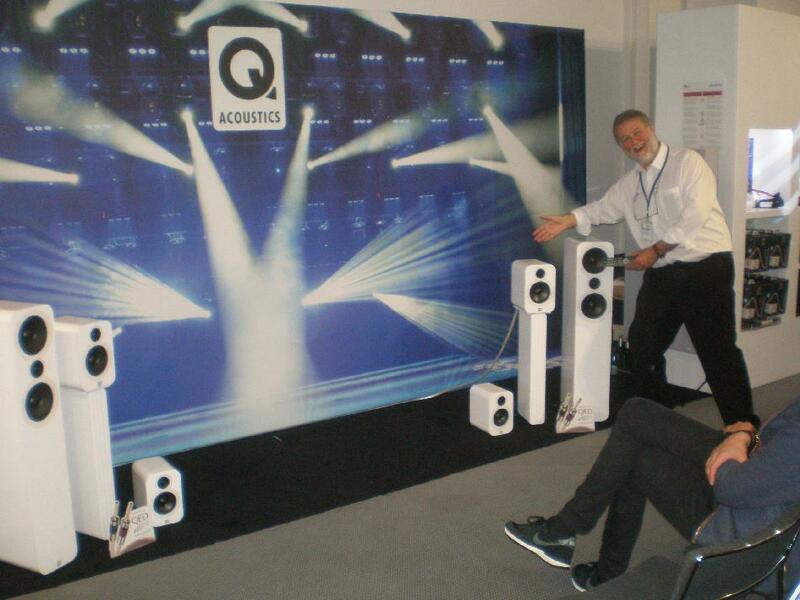 Of course, there are also floorstander loudspeakers, subwoofers, plus all-in-one loudspeakers to connect on the fly to smartphoines, etc. Of course, there was a real bloom of this kind of gear, that made me think that this is the immediate future, if not the present, of modern music systems. I don't want to hide my embarassment in sailing through this mare magnum of proposals, that I hardly could differentiate, surely due to my incompetence, but also because they are often based upon almost standardized solutions (e.g., the ubiquitous DAC ESS Sabre 9018 or, for the less wealthy, 9016...). So, I'll point you to two solutions that more struck me, maybe also because they were better shown off by their producers. Merging Technologies, a company very famous in the pro sector due to its solutions for music production studios, was showing the Nadac, a network DAC that, according to what the very competent company manager I spoke with illustrated, is the only one that supports every format (PCM 44.1 - 384 kHz; DXD; DSD 64 - 256), connects to your LAN via an ethernet port using the Ravenna protocol (that should allow for a maximally clean transmission of signals), is capable of managing a network-based system sporting different sources and different zones. 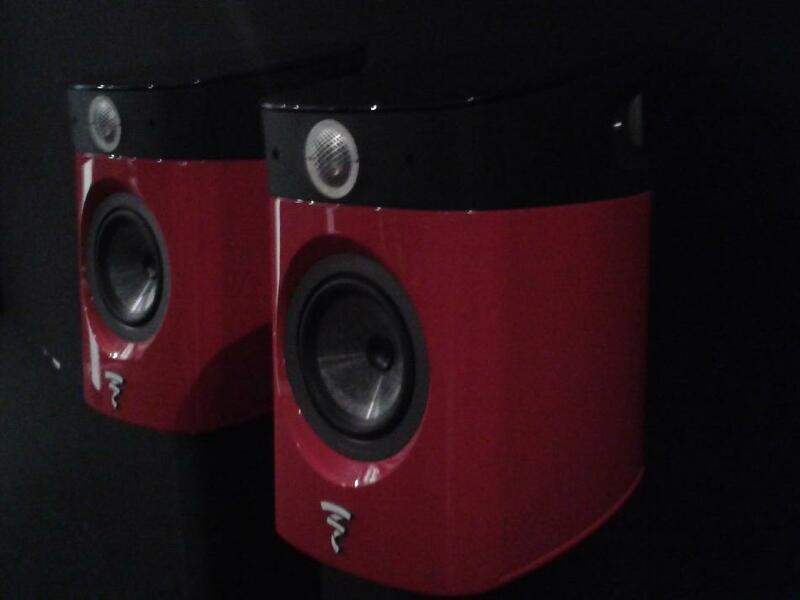 It comes in two configurations, depending on its outputs: plain stereo (€ 8.000) or 8-channels (€ 8.900). Aurender exhibited a crowded range of devices for distributing and reproducing high resolution music files, stored in memory supports either internal (up to 12 TB), or external (NAS), that use a proprietary software to manage the archives (meta tags included) and to command its functions via iPads or the like. New for this year is the full compatibility with Tidal, the online streaming service providing uncompressed CD-quality music. Among the different models I was interested in was the N10 (American price: USD 2.500), that can read files from the internet, from a NAS in the LAN or from the optional internal storage (4 TB - for USD 200 more), to pass the file into a 240 GB SSD that works as its cache memory from wich the file is actually read and sent to one of the - only digital - available outputs (USB and S/PDIF coaxial, optical and AES/EBU on a XLR plug). As you may have guessed, to finally PLAY the music content of the file read from the streamer, you need a DAC and then an amplifier to drive your loudspeakers... or you need an amplifier with an internal DAC, just like the one that (also) Aurender makes: it's the X275 that contains either a DAC (with the ubiquitous ESS Sabre chip), and a 125 W/ch ICE Power stereo digital amplification module, all for an American price of USD 2.500. A little off to the side, almost to avoid underlining their status of outsiders to the pure-audio sector, there were also some companies exhibiting only multimedia servers. One of them was DMA that showed a device that basically is a PC working on Windows 8 (that, according to the enthusiastic engineer that curated the demo, is a very good tool for treating audiovisual streams) and running a proprietary software in which resides the core of its high-end audio and video processing. Everything is placed inside a little box that can be hidden hung on the back of a flat TV, mounting a transport for reading optical disks and ripping them into a memory (internal or networked). It allows the creation of a domestic cloud, the management of an IPTV system, and other evil tricks. Its basic version, the model DMA-06 costs € 3.600 and is ready to be connected to your network; if you want to make it the heart of a more traditional system, you can add the preamplifier module, for a further € 2.500. Of course, it is completely tailorable according to the customer's specific needs. Another one was Purist Music-Machine. Again, a little box, in standard rack dimensions, with a (bit too much) professional look, with a slot-in transport for optical disk reading and ripping, also on a network attached storage, with streaming capabilty, and a dedicated app for the GUI to remote control all its function, etc. All comes for about € 7.000, in the version that includes also a DAC module. I repeat, my intention was not to write an official report, done better by professional reporters, who are more competent and educated than me. Yet, I can see that I wrote a lot and I still have a great deal of information I'd like to pass on to you that was available in such a huge exibition. So, I'd better put here in no order at all some further thoughts and some of the pictures from this year, as I wrote in my foreword, I tried to shoot and that now I put here in a final roll, to satisfy your (our) sane voyeuristic desire. 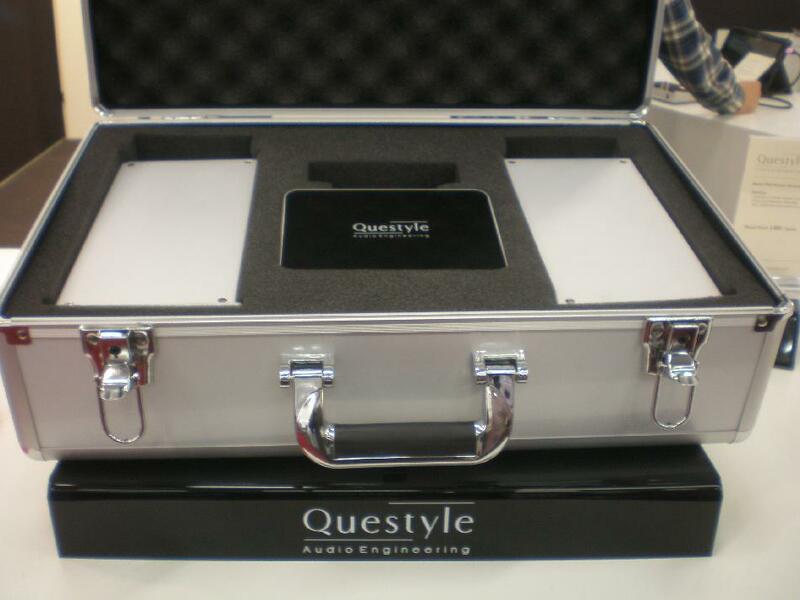 from AUDIOQUEST, the famous USA company, now broadening its success beyond its pristine field of cables that they, anyway, still produce in a very wide range, including also the new generation ones, like USB and Ethernet cables. 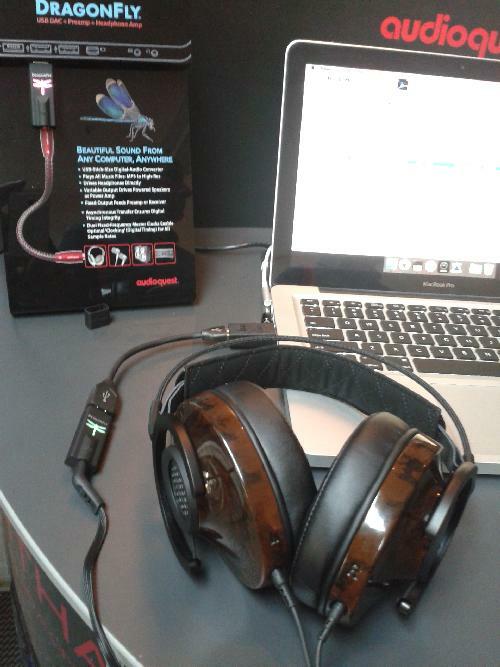 sporting one optical S/PDIF input and one asynchronous USB input and a volume regulator. It's based upon the ubiquitous ESS Sabre 9018, thus managing streams up to PCM 384 / DSD 128. Around the ESS chip we find the usual Ayre's careful design for the power supply and the output stages, the latter sporting also unbalanced plugs, maybe put there also to testify the aim of thismachine to complete also an important rig, despite its look, clearly devoted to a desktop use. the lifestyle amplifier with wireless functions of which I wrote about last year, and that - as its project manager, Mr. Mc Gowan Jr., told me - saw an unpredicted commercial success. 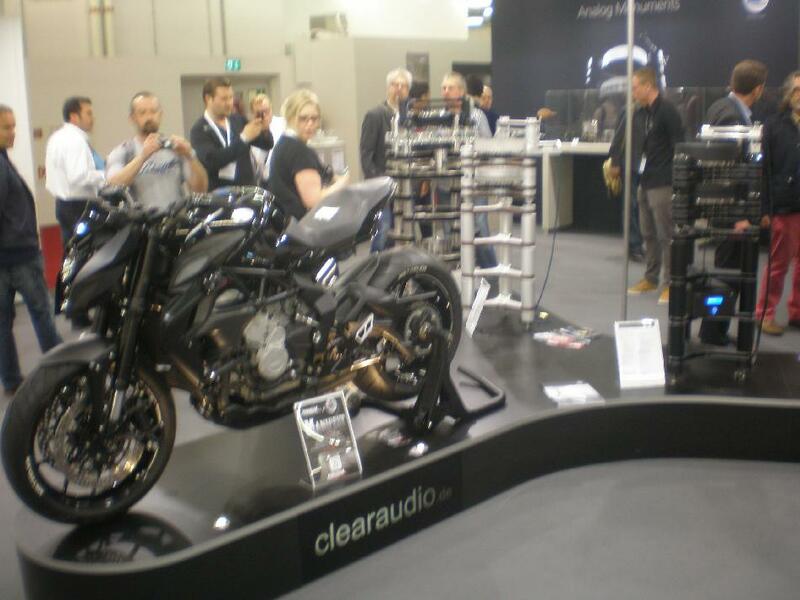 Then, there was the colossus CLEARAUDIO, that exhibited into a great space all its crowded fleet of turntables and... this motorbike, surely one of the objects most photographed at the show. 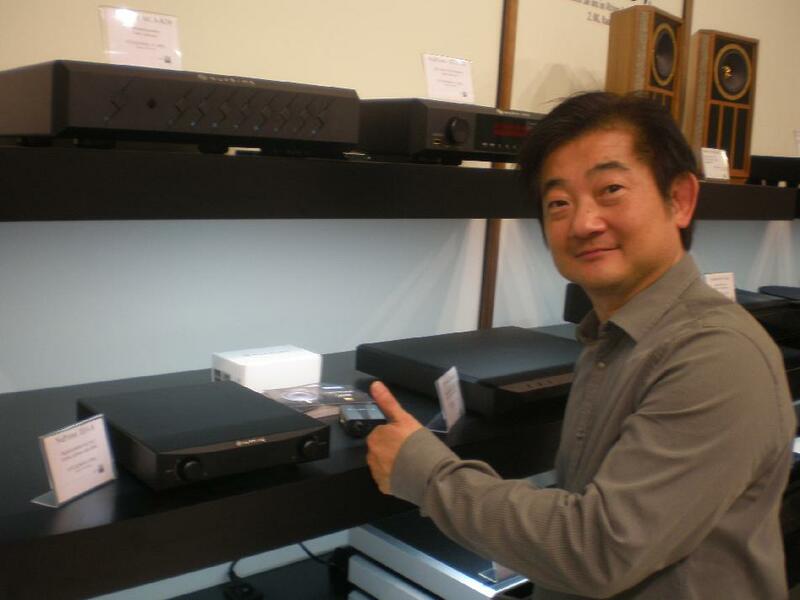 former owner of NUForce - then sold to Optoma, who wishes to complete its audio-video range - and now owner of NU-PRIME, a brand under which he keeps on making digital amplifiers and other devil's tricks. My photo is horrible, but Jason is pointing to two of his new devices that should be commercialized soon, and were exhibited without many specifications. An integrated amplifier and a little DAC/headphone amplifier dedicated to smartphones (it hides behind his big thumb...). Another company that identifies in its boss/designer is Wolfgang Kuhn's LAUTSPRECHER UND MEHR, selling a complex combination of satellite loudspeakers and subwoofers, with dedicated amplifier. 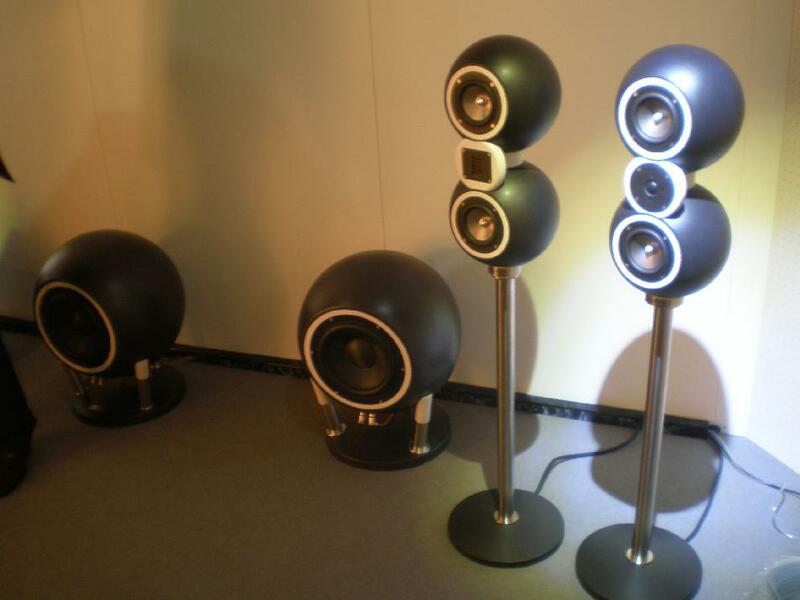 As you see in the picture, this system's main characteristic lays in the spherical form of the loudspeaker's cabinet. At a first glance my mind went back to an old DIY project by Italian magazine Audio Review; but the German system is far more complex, providing also signal processing to drive the speakers, in digital or analog, depending on your choice. 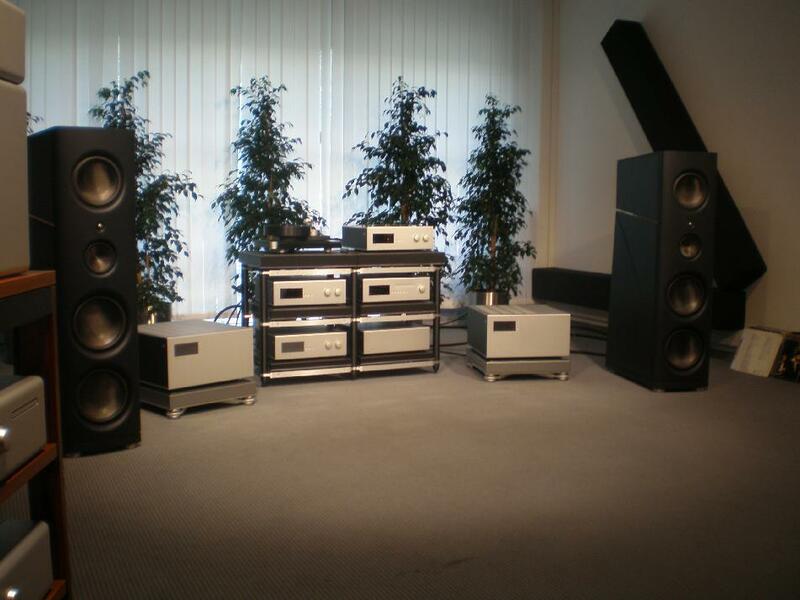 Let me close this quick listing with two among the biggest loudspeaker builders. 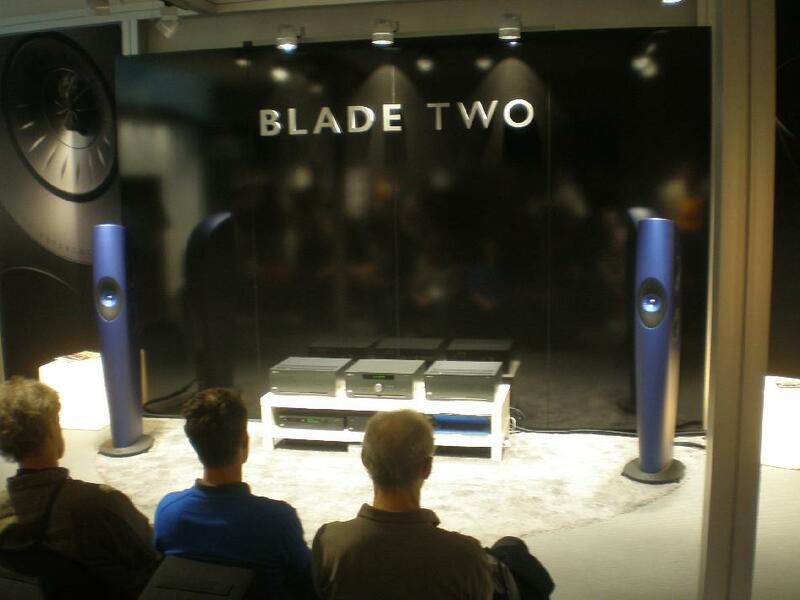 KEF debuted its Blade two, affordable sibling to its top model, the Blade, in this occasion driven by ARCAM amplifiers, this almost to underline that they need a good amplification, yet at human level. whose main characteristic is its changeable dress, that is their lateral sides, offered in a wide range of options. Let me quickly go to the first that was immediately evident to me, since my first flipping through the Exhibitors' list: MCINTOSH IS MISSING! The absence of the iconic-brand of this entire sector is already enough to leave me puzzled, but what surprised me more was its absence among the brands of its powerful German distributor, Audio Reference, who, still, keeps on carrying all the brands belonging to the Fine Sounds group - I don't know how much of this is due to the management buyout by Randall and Grange: in the Fine Sounds group McIntosh is still present... Once again, I point you to my 2014 show article, where I raved about this same distributor's setting, in the same big spaces, with an impressive power demonstration made with a massive presence of the blu-eyed amplifiers. Instead, this year it set up a surely wide exhibition, but less imposing, which didn't allow me to perceive the beauty and the luxury behind its products that I recall from last year (then, mainly Sonus Faber, now much less evidentiated). 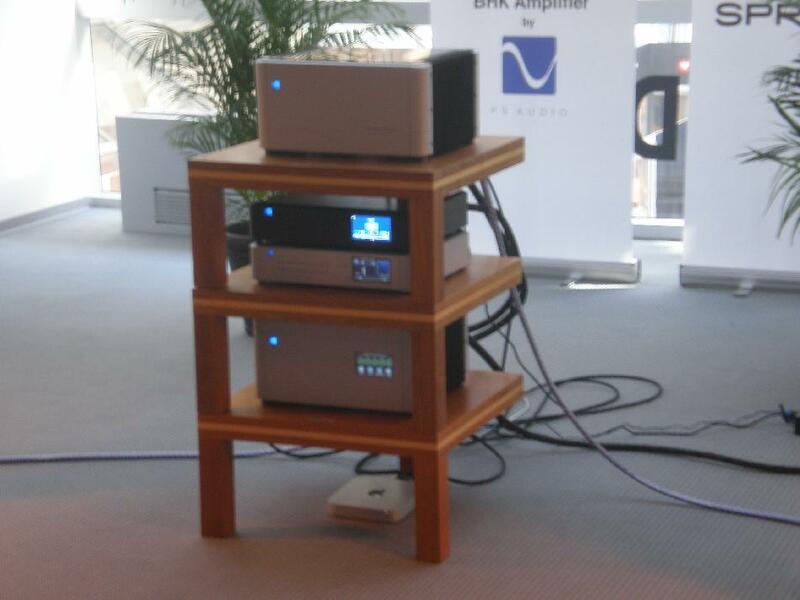 Moreover, the same distributor exhibited some amplifiers both by Krell and by D'Agostino, again leaving me somewhat puzzled. 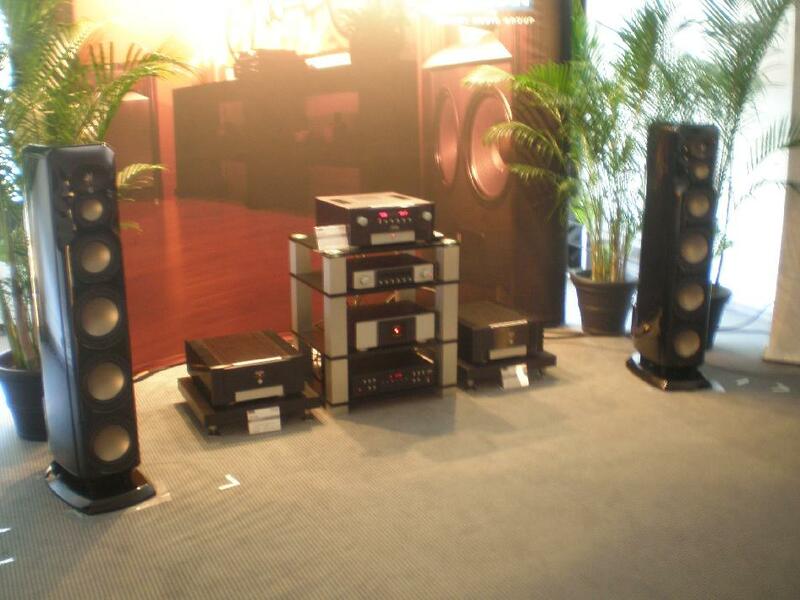 Anyway, on show there also were the new and coveted amplifiers by Wadia and Audio Research. 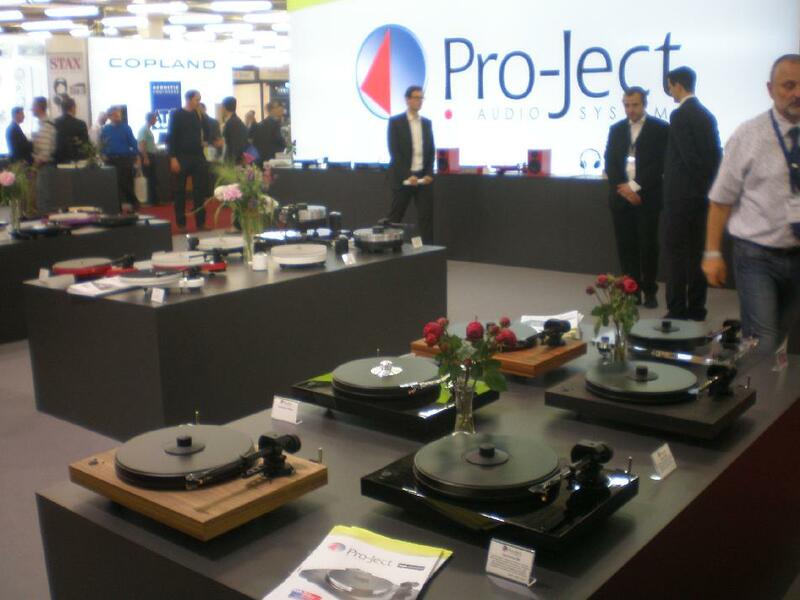 PIONEER had a nice room, not overly big, where it demoed it new products; in particular, the BDP-LX 88 disk player, a kind of anti-oppo (multistandard, Hi-Res, 4 K, ESS Sabre, etc. 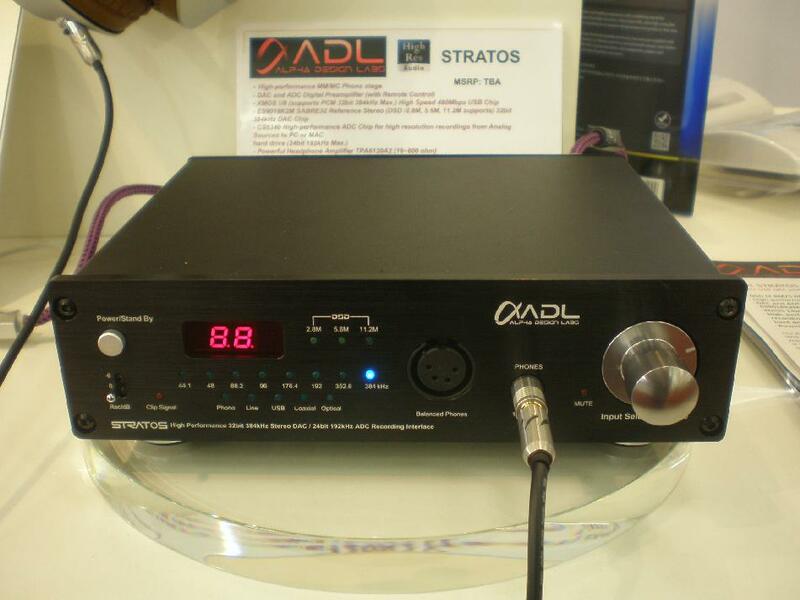 ), and the U-05-S DAC/pre/headphone amplifier (Sabre also here, balanced outputs, powerful amplification, etc.). 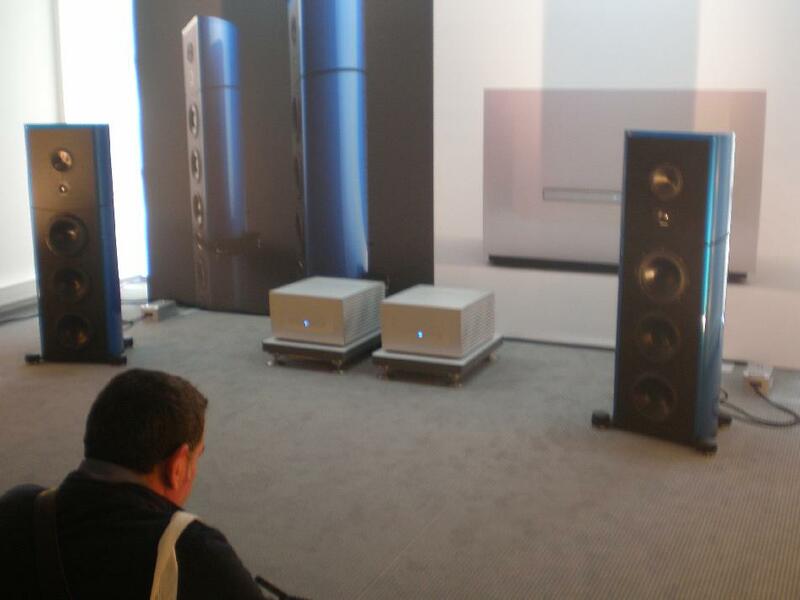 In another part of the room, this company set up also a playing system, with one of its network players, and voiced by two good Dynaudio loudspeakers. That surprised me, because Pioneer makes also loudspeakers, either cheap (some even well reviewed in magazines), or more expensive, a direct consequence of the work of TAD, and very well sounding. I don't know how much this was influenced by the move of TAD's designer, who joined German loudspeaker maker Elac (news of which I could read only in press alerts after the show...). Well, I must admit that also this second part ended up being massive. Yet, I didn't mention lots of other things. Ralf Koenen's PROGRESSIVE AUDIO (once again, a company that substantially identifies itself with a person in flesh and bones), proposed both amplfiers based upon new and efficient transitors, some Silicon Carbide FETs, again very expensive (starting from around € 10.000), andloudspeakers, again completely homemade built around drivers by Accuton and Seas. 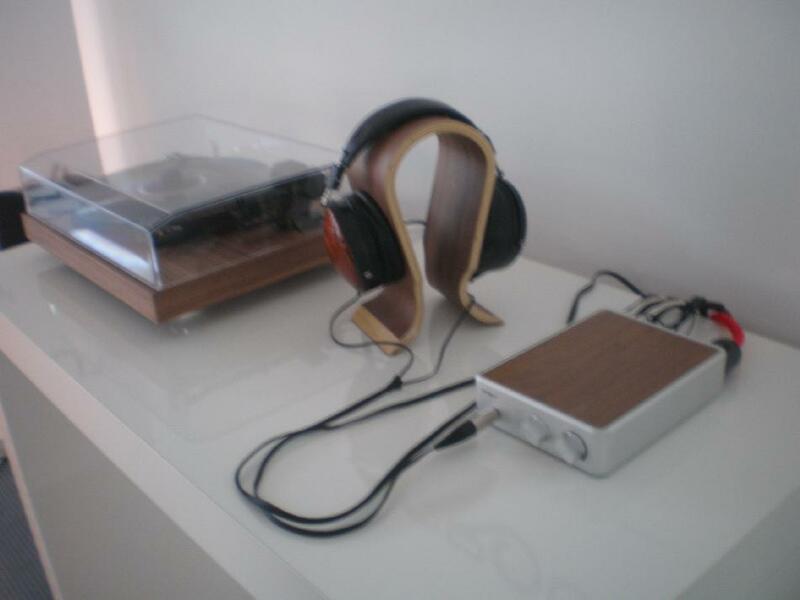 I listened to the Extreme III (€ 8.000 circa) and it made a very good impression on me.